Information from the Onorcaduti website indicated that soldier, Carmine XXXXX, born in Sora, member of the 53° infantry regiment died 12 February 1915. However, according to his military record, the soldier died in Sagrado on June 29 1916. We had written to the town of Sagrado for the death record of Carmine and this is the response we received….. If I recall the story the day 29 June 1916 was the date of death of many Italian soldiers who were asphyxiated by a cloud of toxic gas. If, on the other hand, we do a thorough research on the 53° infantry regiment, also known as Regiment Umbria, it turns out that he started fighting from 5 June 1915 the Monte Piana, in the province of Belluno. Several sites reported news from the regiment fought only in the area of Belluno. To better understand the whole story, I must now tell you a little of our history. Our area of the province of Gorizia became Italian in 1921 following the so called ” Treaty of Rapallo “signed in Rapallo, the 12 November 1920. Up to the year 1924 the civil registration records did not exist. Births and deaths, and weddings, were recorded by the local parish priest. During the war, however, the registers of the Parishes were closed on 13 May 1915 ; for evacuation. The priest of the time resumed recording births and deaths only in 1918. I can also tell you that the parish registers only recorded deaths of residents. The deaths of the soldiers were recorded only by officers present at the time of the conflict. I should also inform you that the cemetery of those gassed soldiers was known, during the war, as Sdraussina, now Knoll 3rd Army (it is called so just for the arrival of the third army during the great war), however, it is still a part of the Municipality of Sagrado. The bodies were transferred in the nearby shrine of Redipuglia. 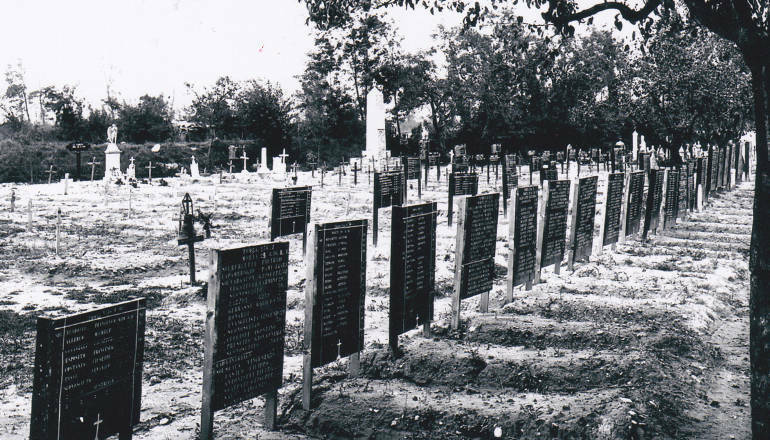 The site of the original cemetery of the gassed soldiers is now a closed textile factory. I close my letter writing that maybe there is a mistake in the date of death reported in the Onorcaduti lists. The soldier Carmine XXXXX cannot be dead before the start of Italy’s entry into the war, dating back to May 1915. It is certain that for us the Italians were heroes, fighting for a town that is so dear to us. And for me it was a real honor to be able to write about him.